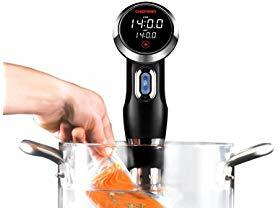 Today only at Woot.com this Chefman Sous Vide Precision Cooker is just $39.99 (Reg. $100.00)! Professional Cooking for Restaurant Quality Results: The Chefman Precision Cooker makes it easy to create restaurant quality dishes at home; it's high quality PTC heating technology keeps water at the precise temperature needed for succulent Sous Vide results, locking in juices, flavor, and preserving the nutritional quality of food with incomparable taste and texture. Resources: Includes access to Club Chefman for tailor made step-by-step recipes, tutorial videos, cookbooks and more! Offer valid 8/3 only and while supplies last. Shipping is FREE for Amazon Prime Members or only $5 flat rate.